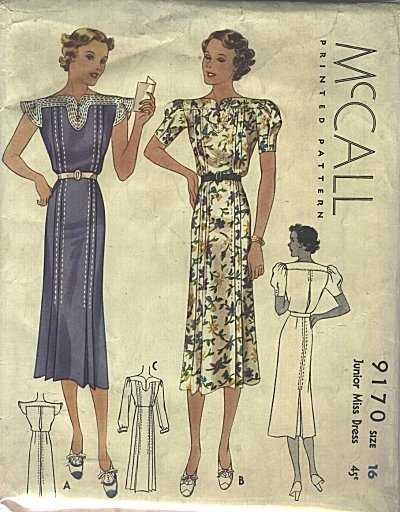 PATTERN: none really; I drew my own pattern for the top attachment based on a cocktail of my 1937 McCall 9170 for sleeves and Simplicity 2362, year 2010, for bodice and neckline shaping. 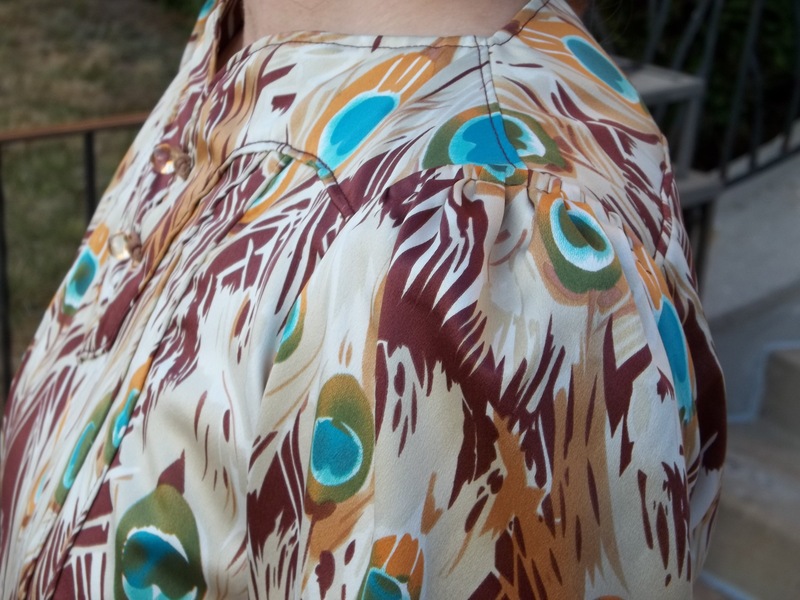 Both patterns have been made already, my peacock pin-tucked blouse and my navy sundress. 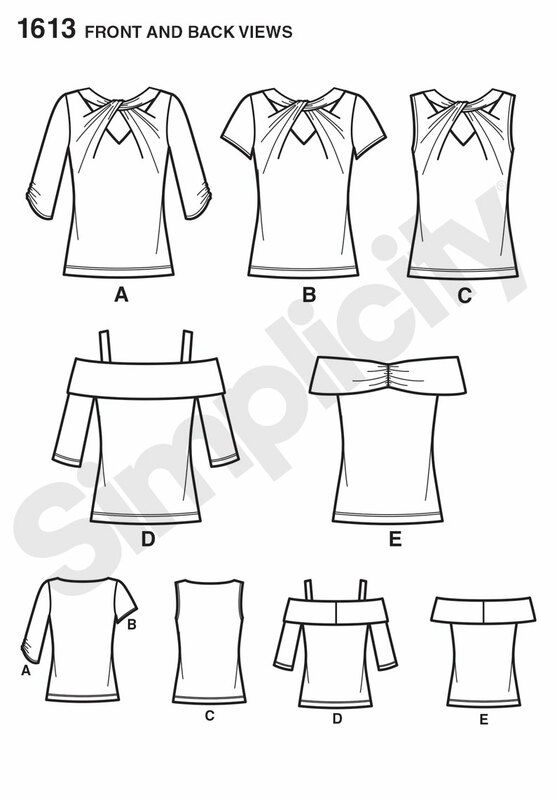 See – these two patterns below at right were changed/adapted into what you see I’m doing in the full picture. 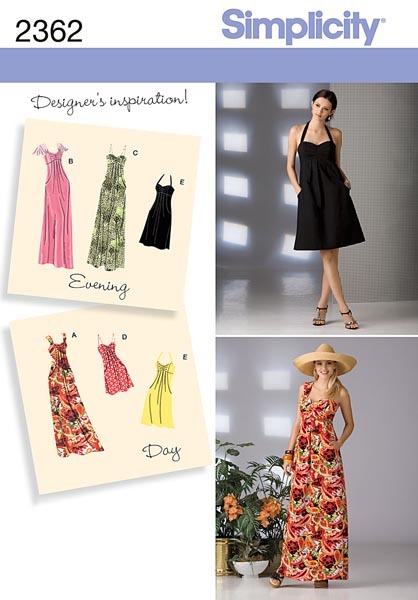 At first I thought of refashioning this sundress into a “Macaron” style dress (by Colette Patterns, see picture below right). 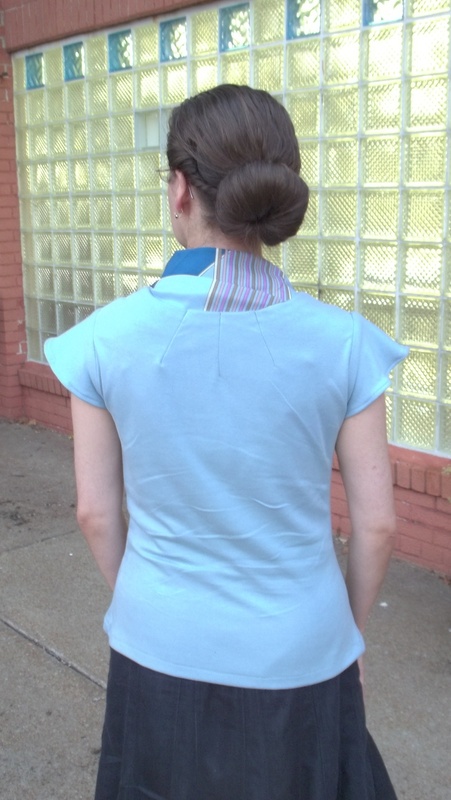 I even had a matching turquoise blue top which I pinned to the to p of the sundress, with the front shaped into somewhat like the front of a Macaron dress. 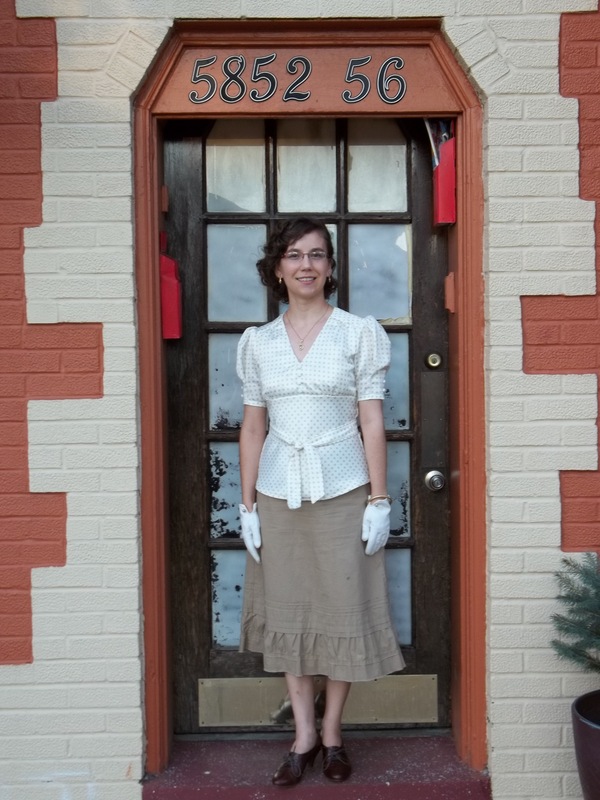 However, I waited a day or two before making this refashion permanent, and, as you can see, I ended up taking everything from my first attempt apart. I really wanted something more unique and original, as there seems to be a multitude of versions of the Macaron dress, so that’s why my add-on top is self drawn. 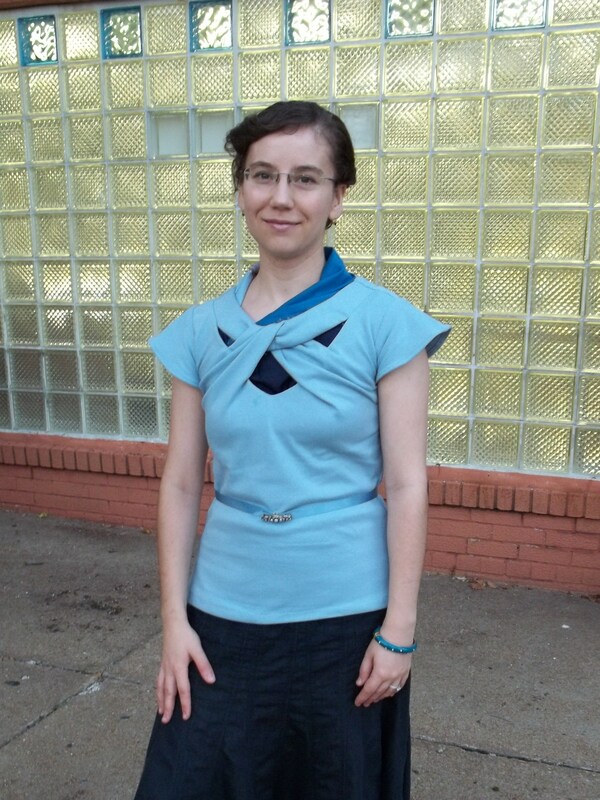 The thick ponte knit I used for the add-on top to my sundress really went a long way for only buying a half a yard. 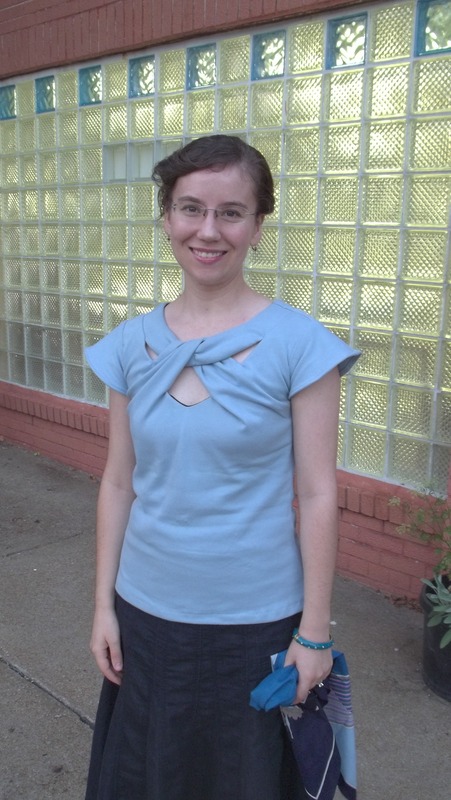 Not only did the knit get utilized enough to cut FOUR pieces of my top add-on (two were the facings with the front and back being the same), but I also used the two very small rectangles that were leftover to refashion another dress as well, my ‘modern art’ red dress. 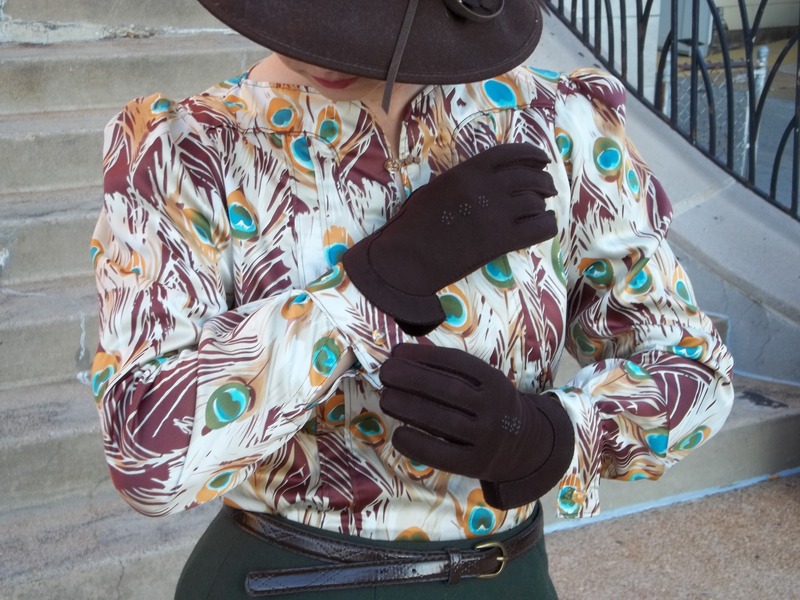 I’m so proud of how I can find a way to use up every inch of so many of my scraps of fabric! 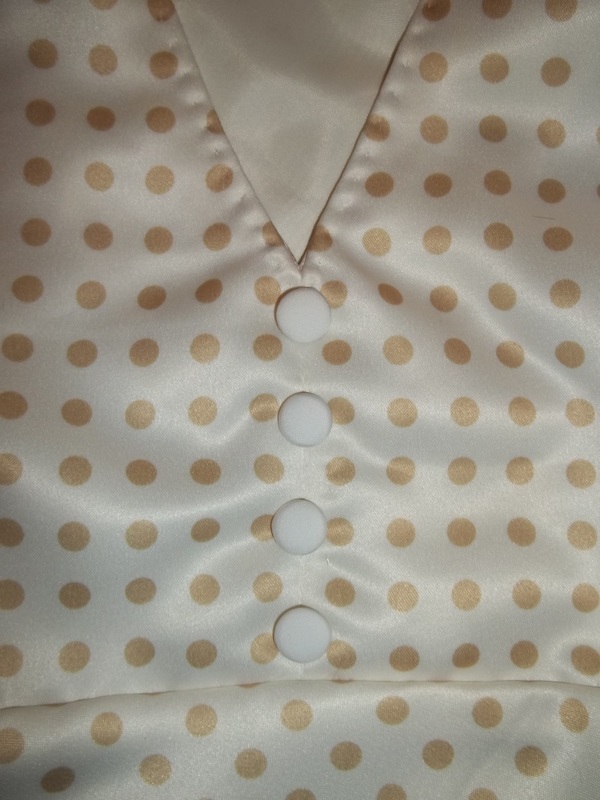 There’s not much to say about how I put the bodice together for the top of my sundress. 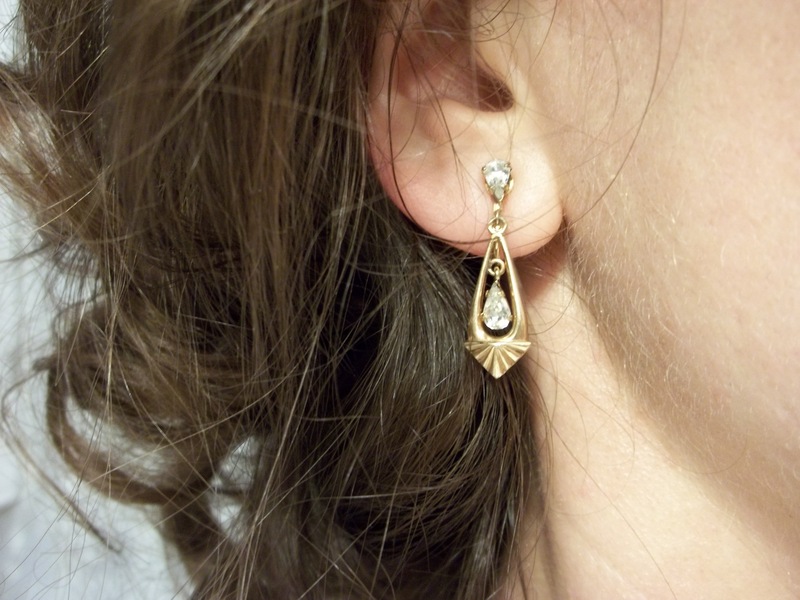 It was fun and simple. 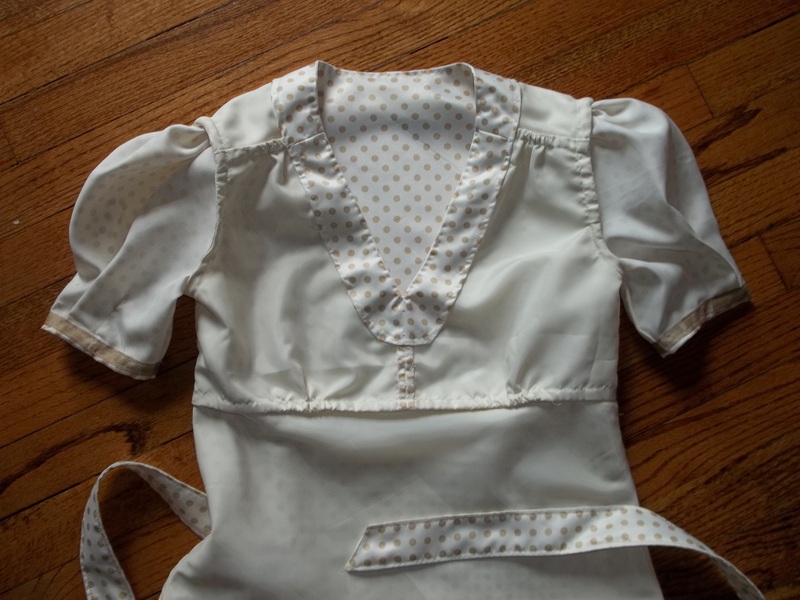 Like I said, I cut out four bodice pieces (cut on the fold, by the way), sewed the shoulder seams together along with the sides, then sewed the top to its facings, right sides together, all along the neckline. 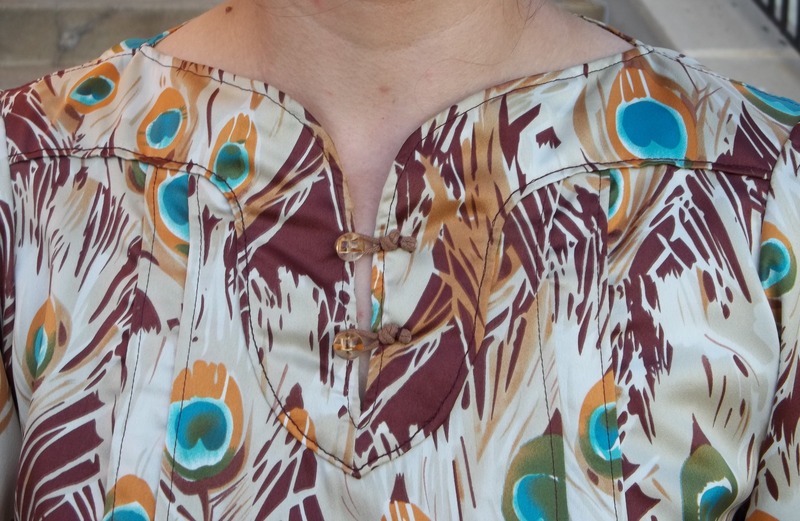 I made sure to pivot at the corners to retain the unique shape of the neckline and clipped at the corners before the bodice was turned right sides out and top stitched down. 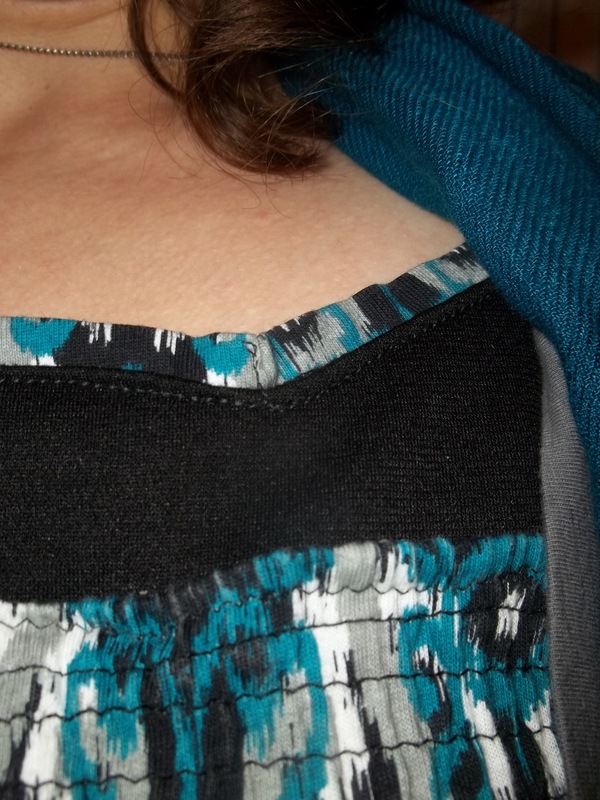 Hubby was an immense help by holding the top of the sundress and my add-on top stretched out together so I could pin everything in place. 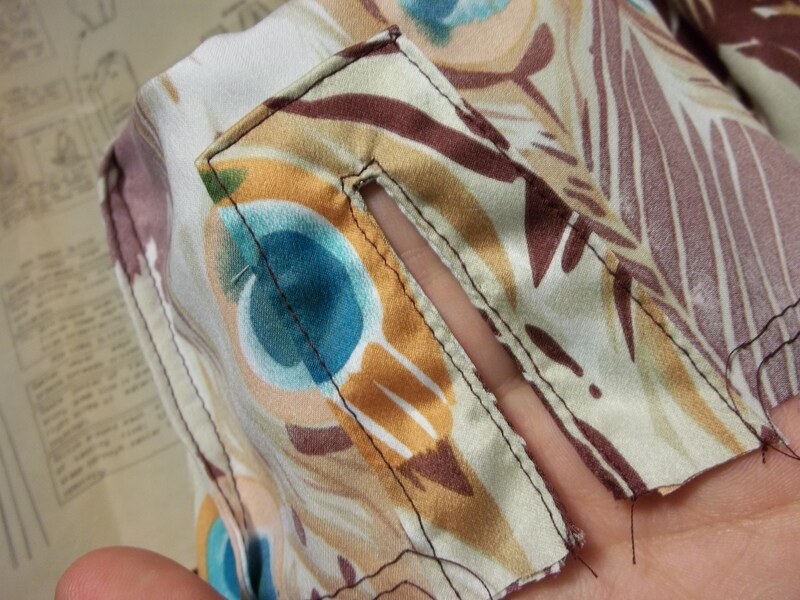 My stitching to attach the top to the sundress is rather invisible – I followed along the rows of stitching already on the elasticized bust area. 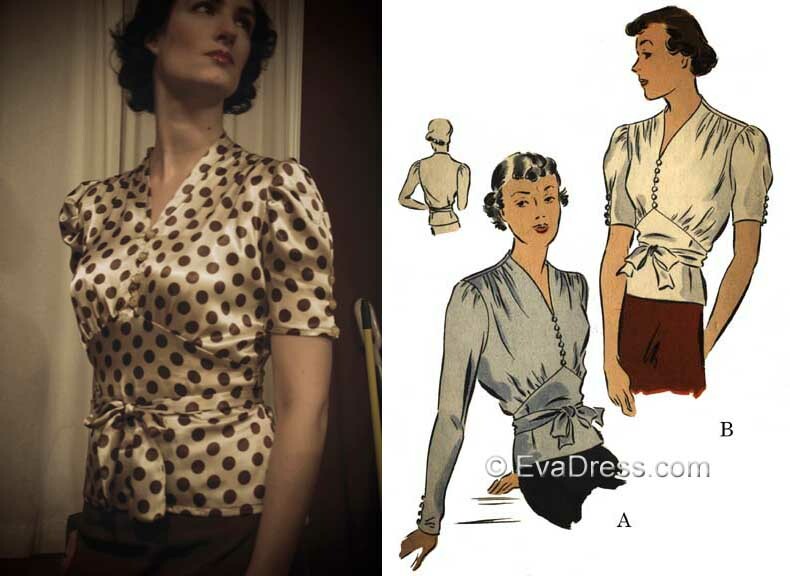 The picture below might show the true colors better and also show a detailed look at how I did the neckline. 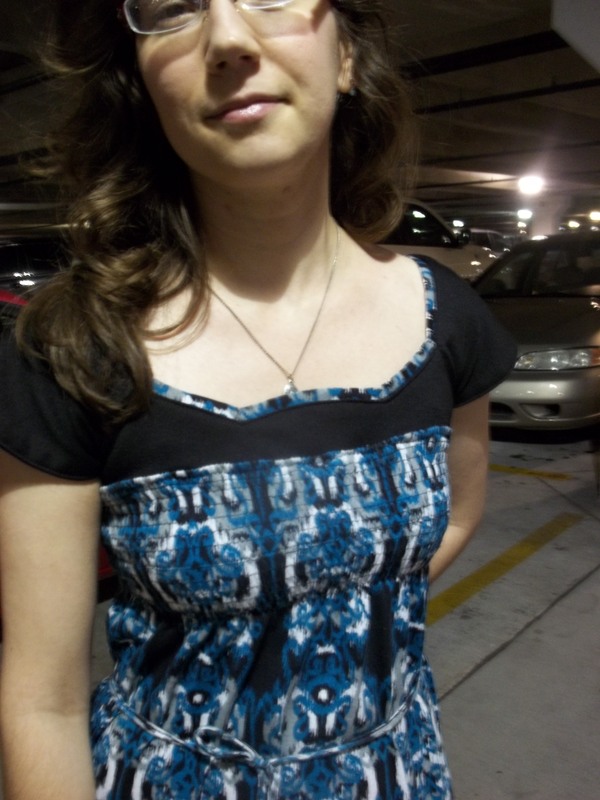 After the add-on top was done, I tried on my dress and something was missing to spice up my refashion. 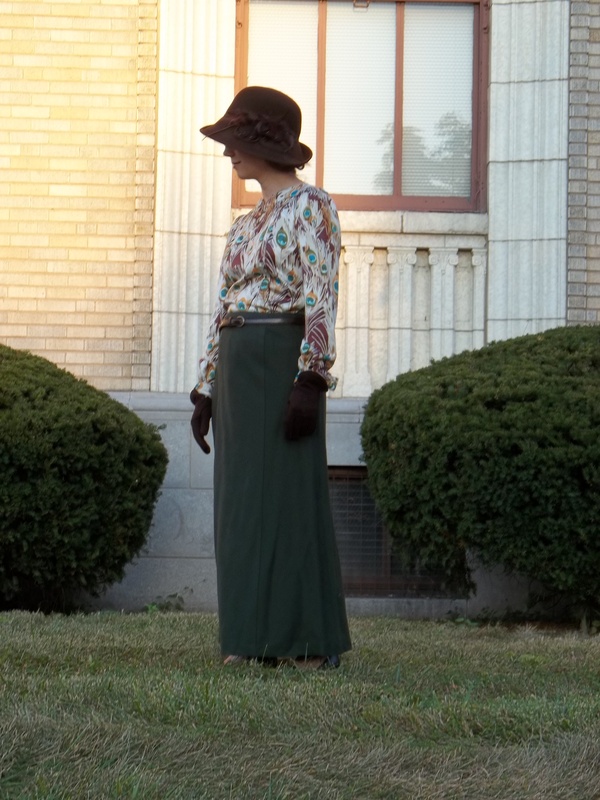 The overall length was also still a bit too long for me, and the bottom hem swept the ground even with heels or wedge shoes on myself. 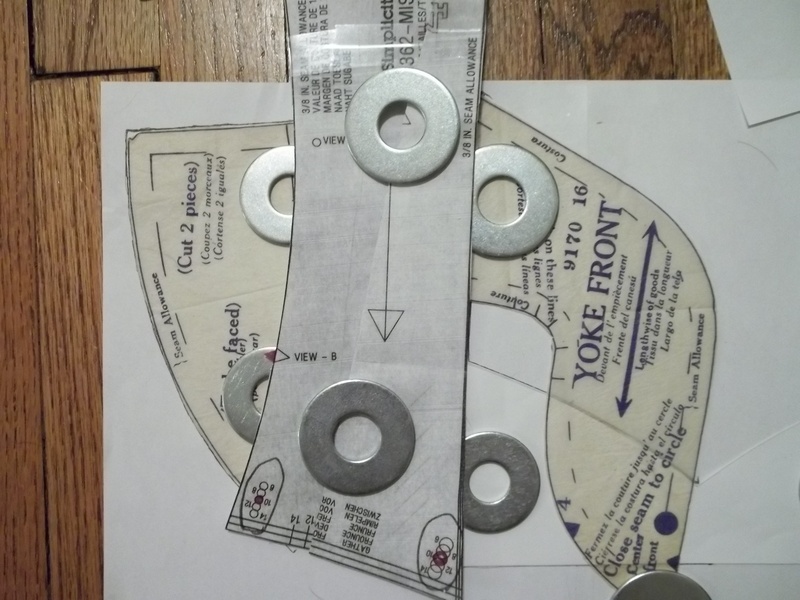 An inch or two was measured off the bottom hem and that was used as a trim for the neckline edge of my bodice, with the inner corners shaped by hand sewing in triangular seams. 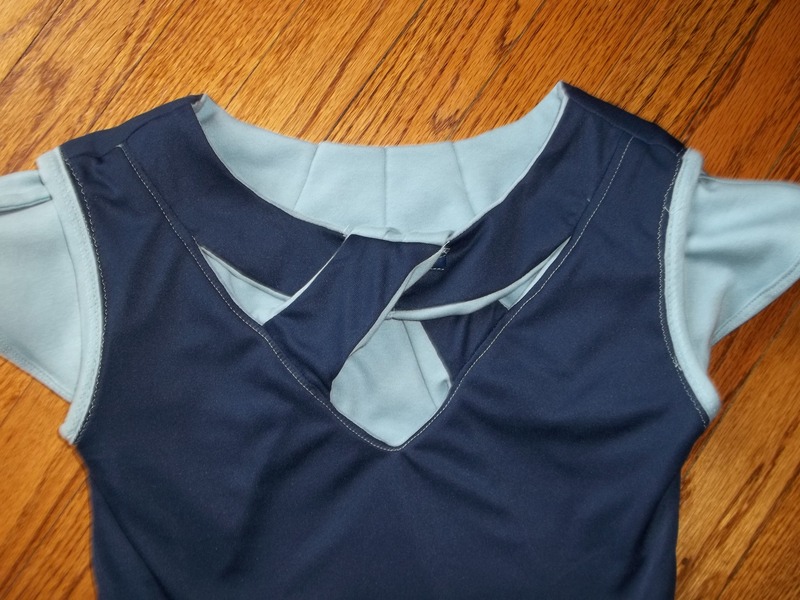 I think this adds just the right touch to my dress; the neckline edging connects my addition with the rest of the dress while drawing attention to the shape of my bodice. 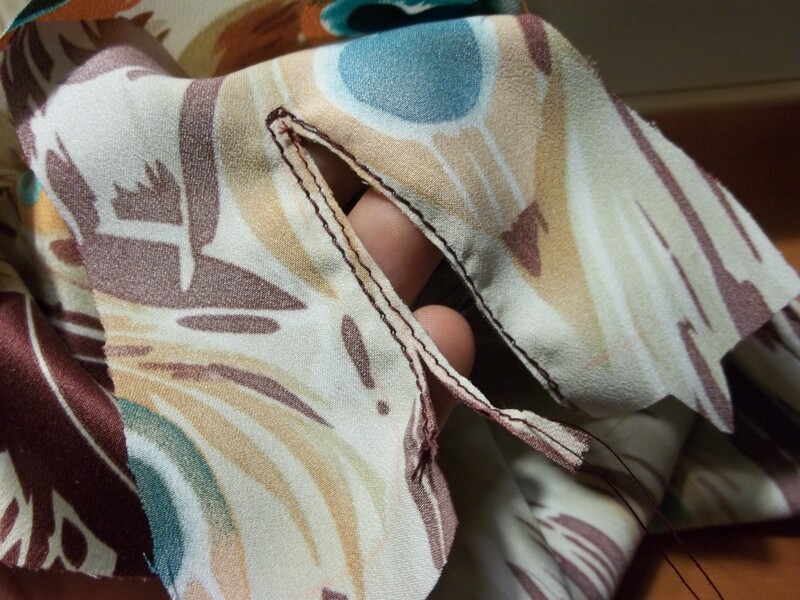 Besides, the hem needed to be shortened anyway, so I might as well make something useful out of it! 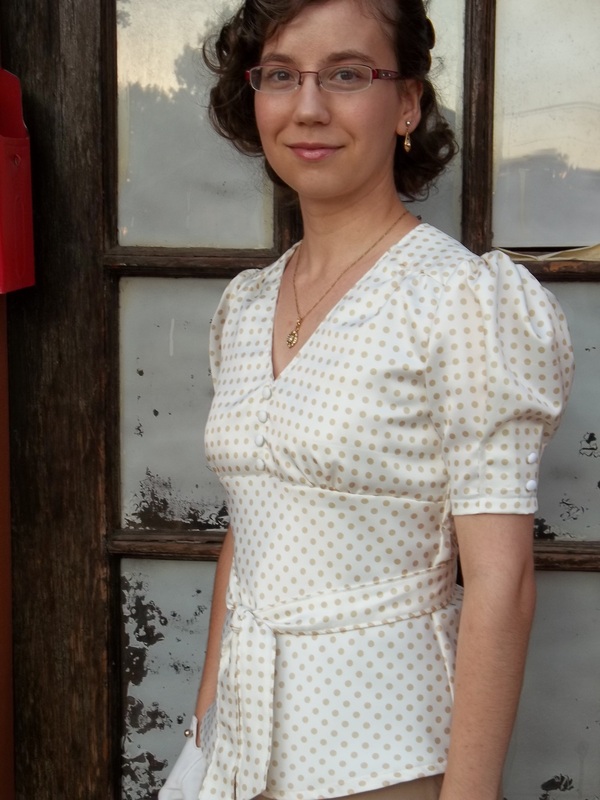 I have had a few people question me about how I got the neckline to match the dress, and everyone is surprised when I tell them something I made it from the hem. It’s more simple than it looks. 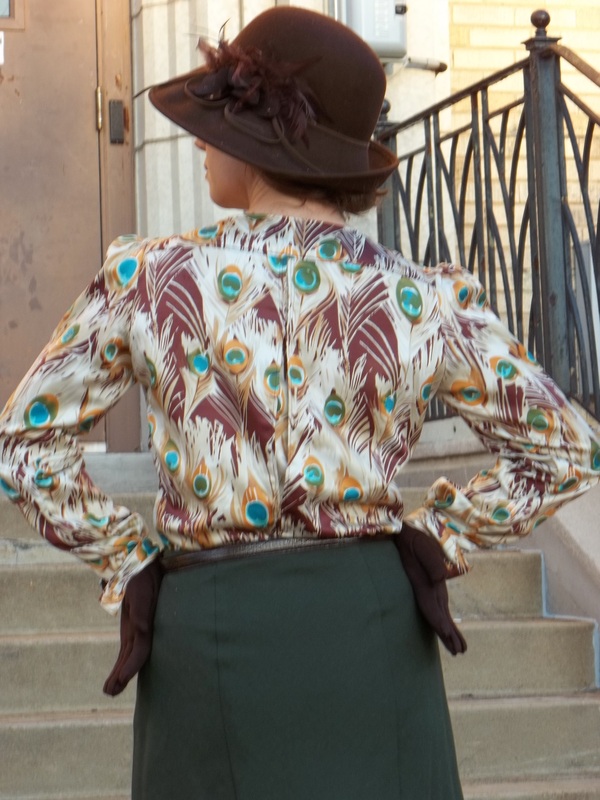 If you look at the close-up full view shots, you may also notice my ‘belt’ matches the dress fabric as well. My ‘belt’ is merely what used to be a tie. 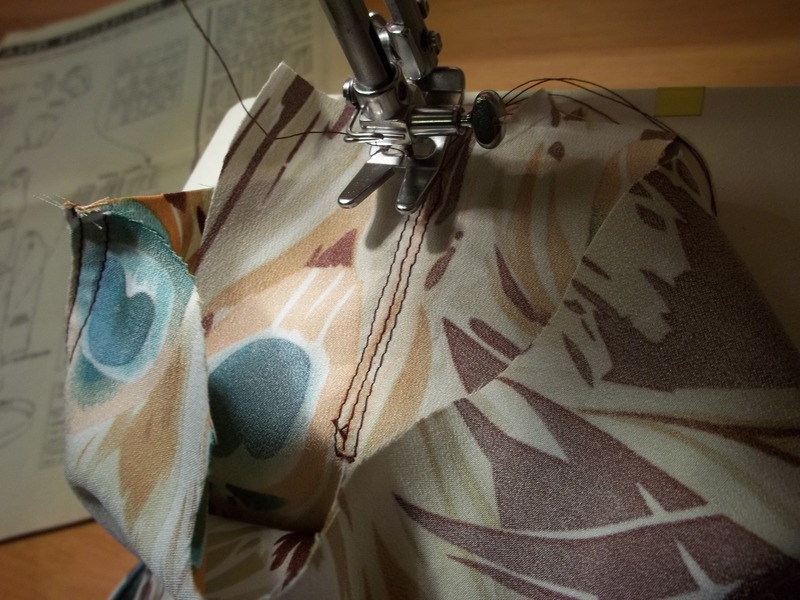 The ‘belt’ strip went around a wooden circle at the front center of the original sundress, to be tied at the back of the neck so the dress would stay up. 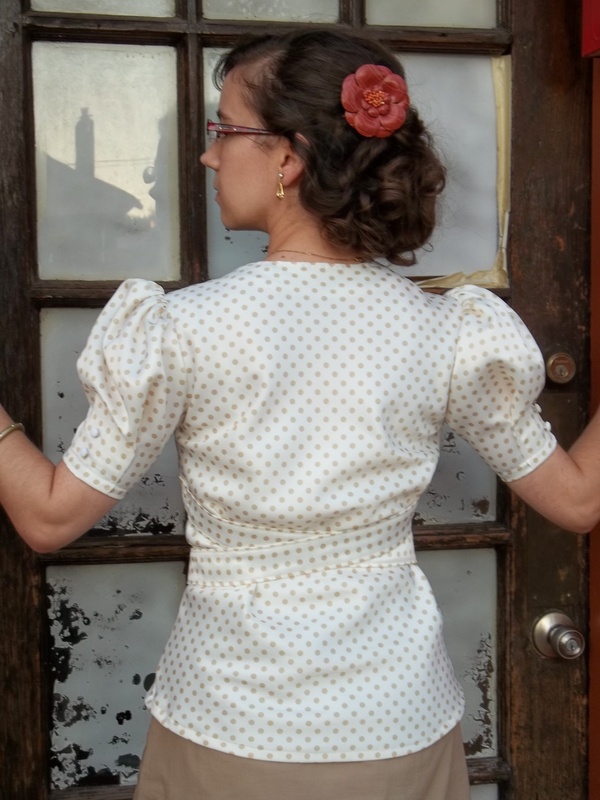 One of the first things I did to my Goodwill purchase was to take that wood circle and its tie off of the dress, but I’m still using it to define my waist as a belt. 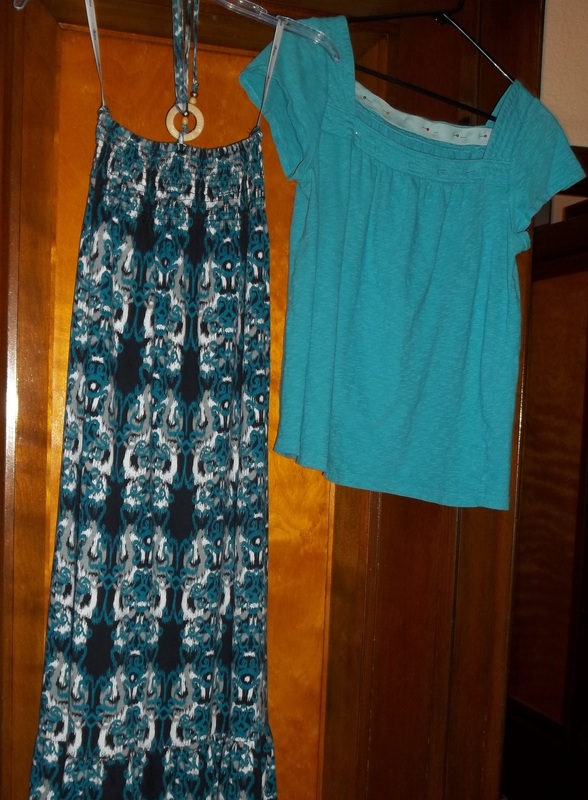 No, I didn’t forget to take a picture of the original sundress, and the top which I tried for my first refashion of the bodice is included in the picture also. 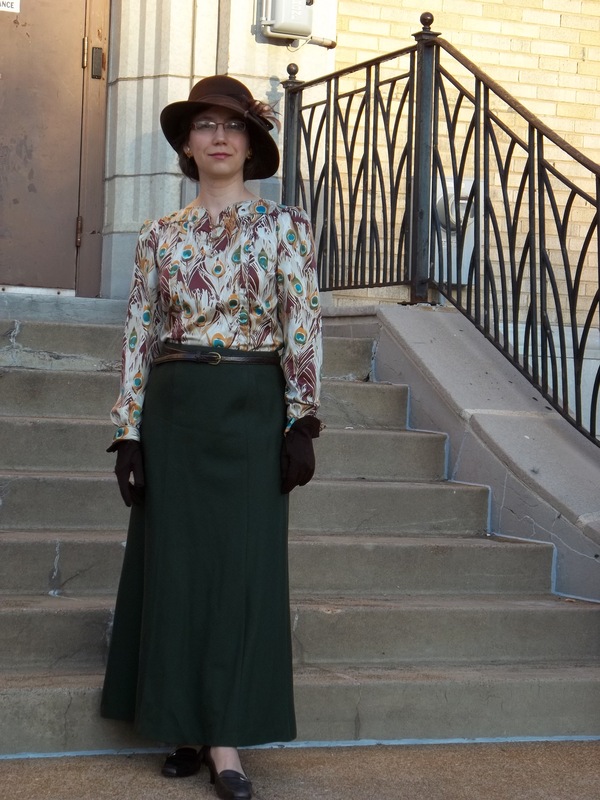 We had hardest time getting my refashioned dress’ colors to come out true to life in our pictures. 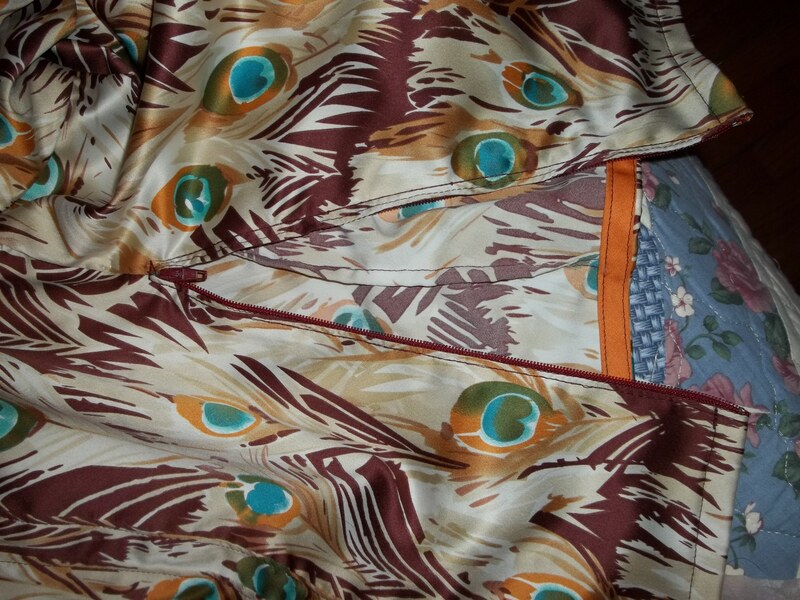 In reality the colors are more of a steel grey, white, and a peacock-type of blue-green turquoise. 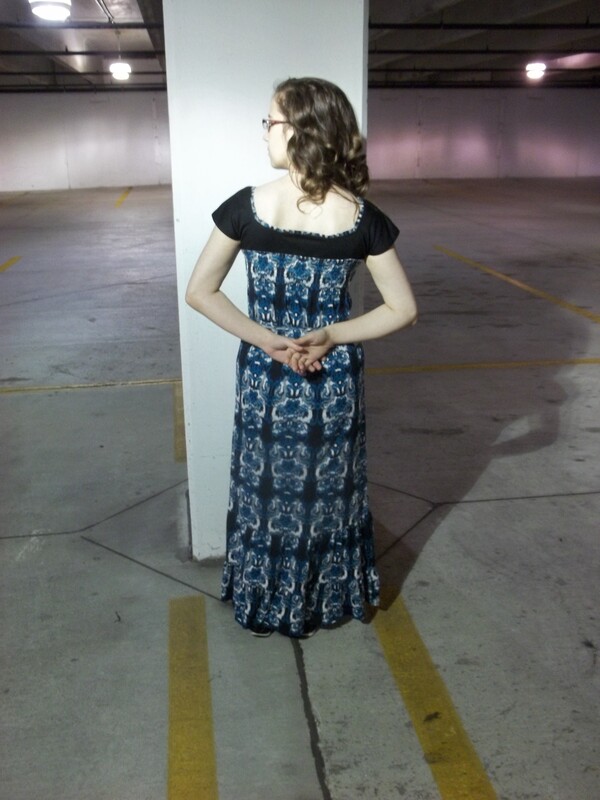 Whatever the colors look like, I am a big fan of the design (print) of my dress – the long rows and the slim shape tend to make me seem much taller. 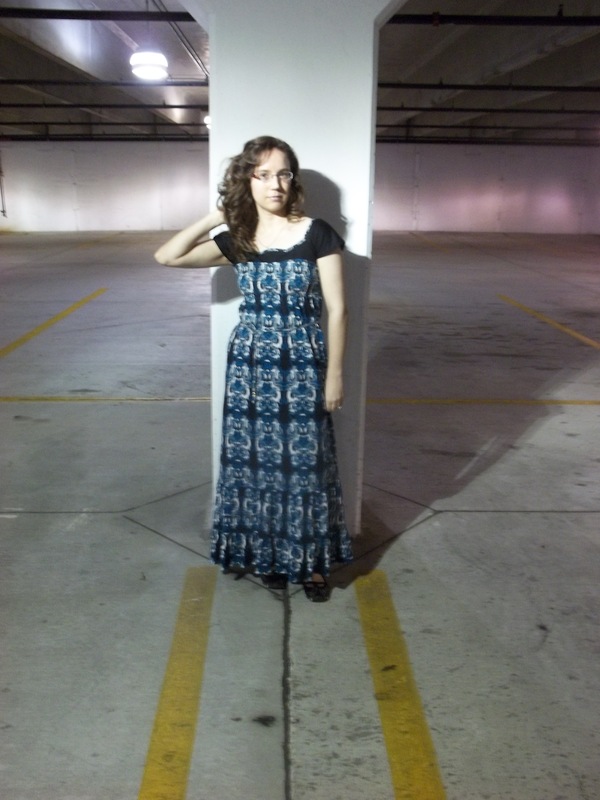 Hubby gets intimidated when I begin to creep up to his height…that’s why this dress makes him smile, along with the fact that it’s one of his favorite of my refashions. 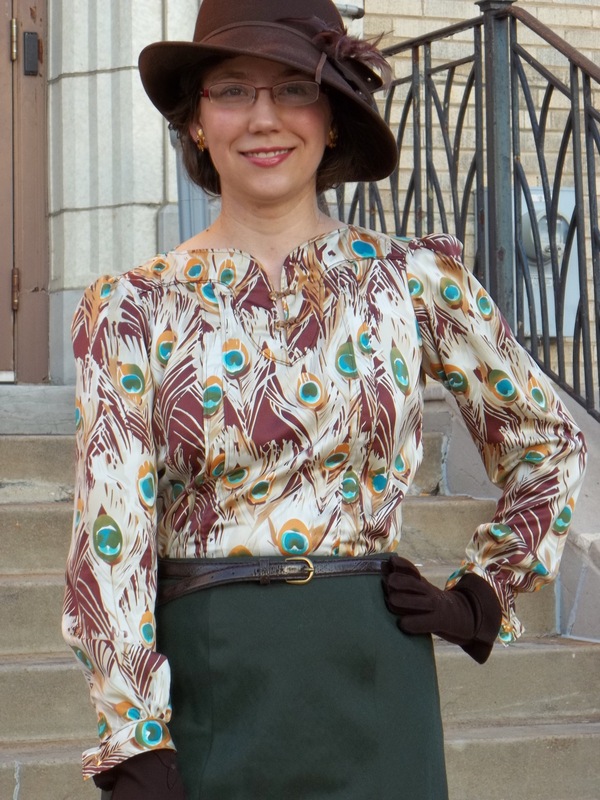 I wear this dress very often, spring into the fall – its so comfortable, so easy to match with accessories and sweaters, scarves, and the like. It’s funny how I remember all the details about this photo shoot. We were out getting some last minute necessities in the afternoon on Holy Saturday of this year, and it was pouring down buckets of rain when we were done. Luckily we had parked in the parking garage but at the same time we were really not going to leave until the rain let up a bit. So we ended up goofing around, killing time but enjoying it. 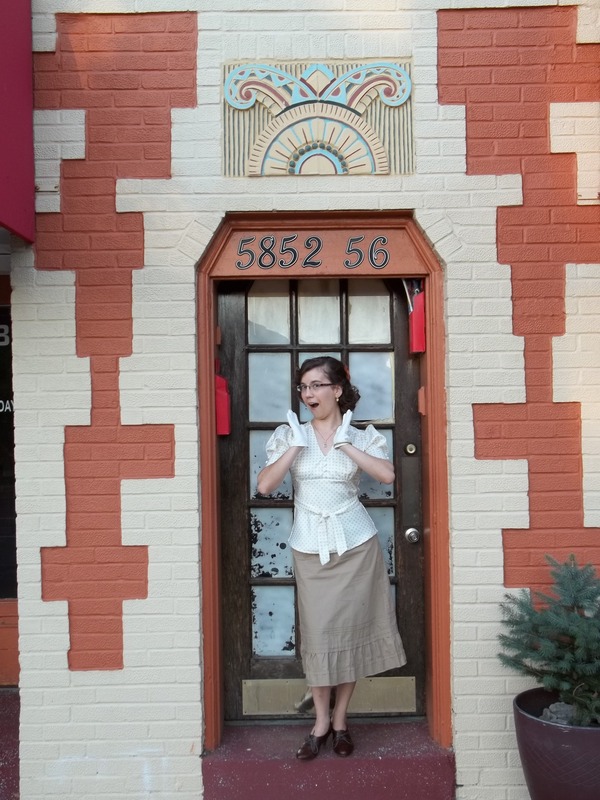 We had the camera with us as well, so that was how we did our photo shoot. 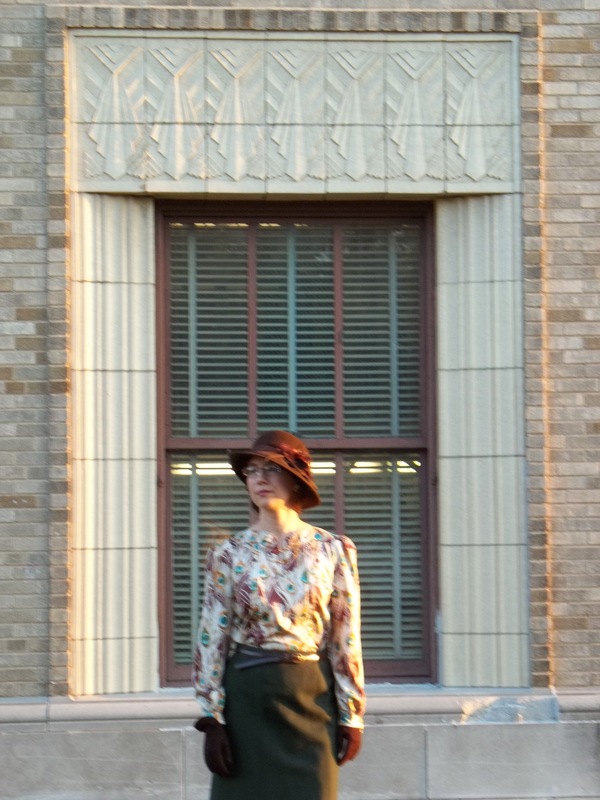 I think the parking lot stripes and the modern city look turned out to be a fine compliment for my refashioned dress.